Eeee! 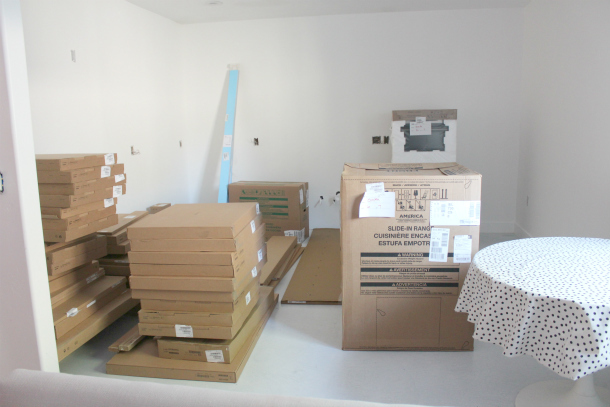 Everything for our IKEA kitchen in the basement is coming right along, and I'm seriously SO excited! 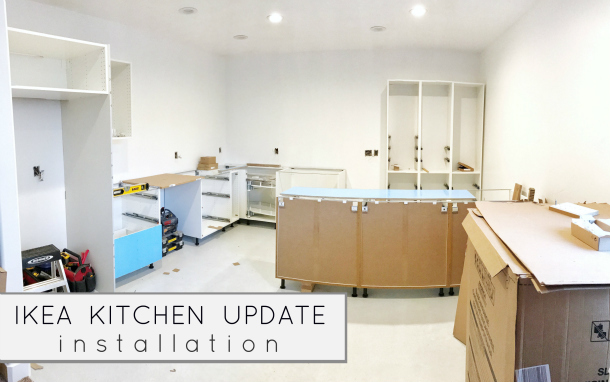 I wanted to make sure I shared updates and progress photos, because I had a handful of emails and direct messages on Instagram asking how everything actually works when you choose to go with IKEA kitchen plans and products. So I'm going to try to answer a few real quick! 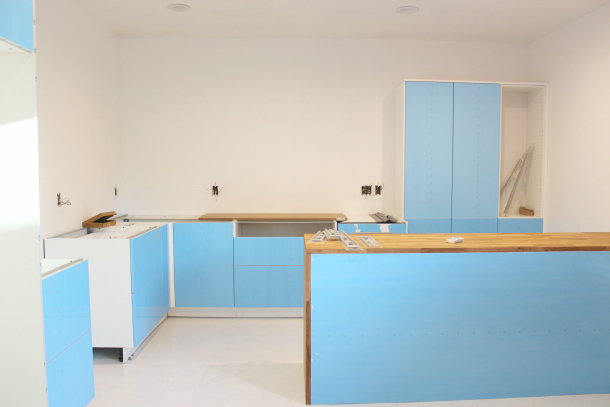 First and foremost, let me start by saying that if you ARE interested at all in looking into IKEA kitchen products for a project your working on soon... go NOW! They are just about to wrap up their awesome kitchen event, where you can save up to 20% on their already budget-friendly kitchen materials until April 9th, if you are an IKEA FAMILY member (which is free to sign up for). DETAILS: Offer valid March 1 – April 9, 2017 for IKEA FAMILY members. Includes SEKTION cabinet frames, fronts, drawers, shelves, cover panels, molding, toekicks, legs, hinges, countertops, appliances, sinks, faucets, knobs and handles, UTRUSTA fixed interiors, UTRUSTA and OMLOPP countertop, interior glass door cabinet, and drawer lighting. Save 20% on a single kitchen purchase over $3000 or 15% on a single kitchen purchase over $1500 not including tax. This offer cannot be combined with previous custom countertop offer. Additional terms and conditions apply. PLUS... right now you can also get a FREE in-home kitchen plan from a designer, (like I showed in our last post with Sean) which I think is a must - to get a good professional, visual idea of how everything will perfectly fit and function in your space. 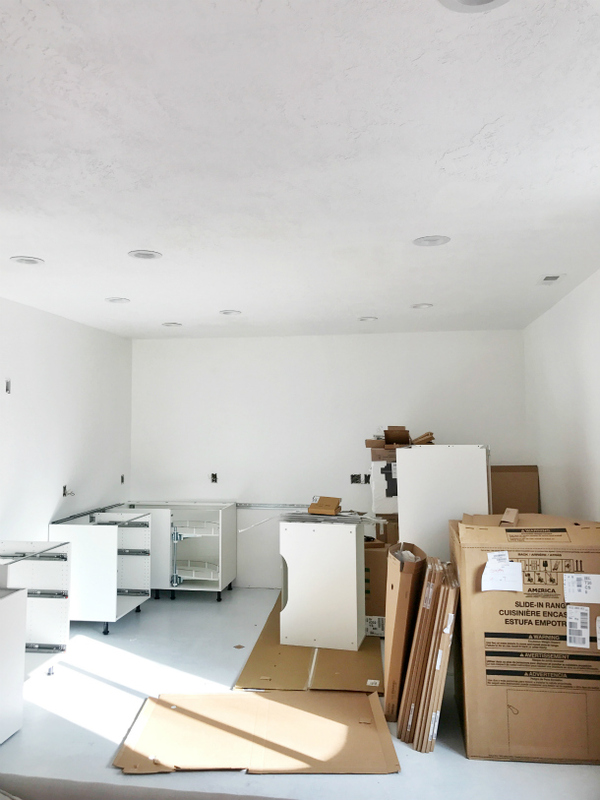 Okay, now that you're filled in on all of those must-know details, the two questions I was asked most were, "What does the kitchen look like when it comes to your house? Is there a ton of stuff to store?" and "Are YOU putting everything together yourself?" 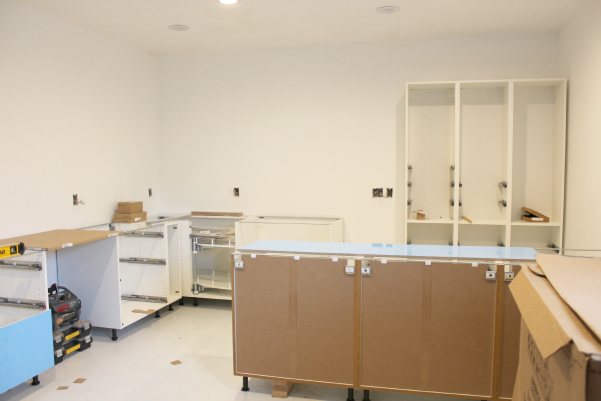 We had our kitchen supplies delivered, everything was brought down to the empty kitchen space and stored there until installation. You can see how everything arrived in the photo below. 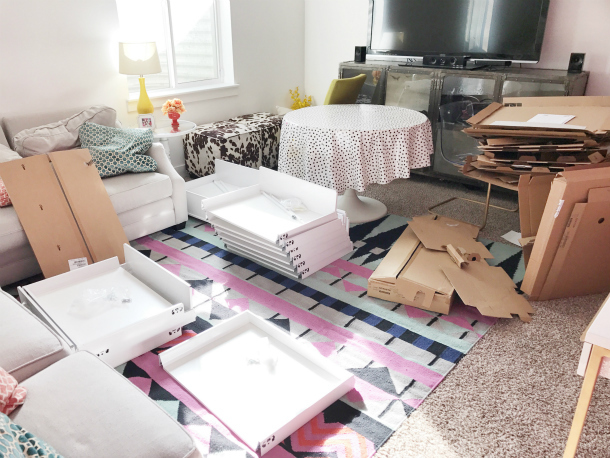 Everything is boxed until assembly time. So for the big question... DIY or hire out installation. BOTH are equally good options. That's what I love about going with IKEA products. Because, in addition to saving lots on money on the materials already, you can build and customize them yourself! I love that moment when everything starts really coming together, and you can see what you designed on paper, start to take shape in REAL life! eeeek! Like I said in my first post when I talked about the design of the kitchen, we opted to go with a sleek, warmer, wood countertop + waterfall edge for the island. 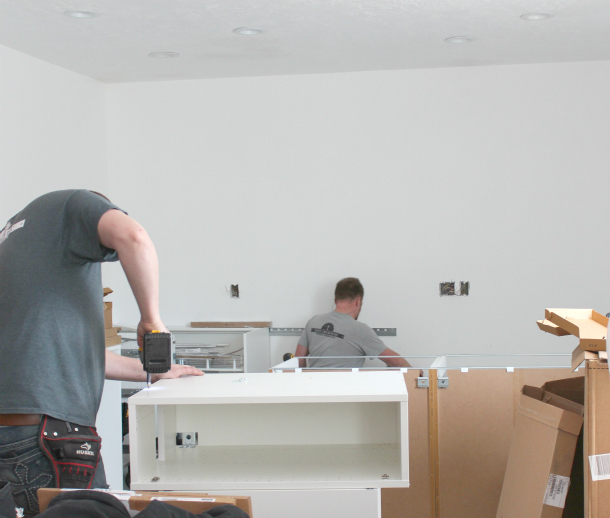 But for the rest of the kitchen we will be getting a quartz countertops installed. So more on that AND backsplash plans soon!